Pineapple Poke Cake is reminiscent of Fruit Cocktail cake. 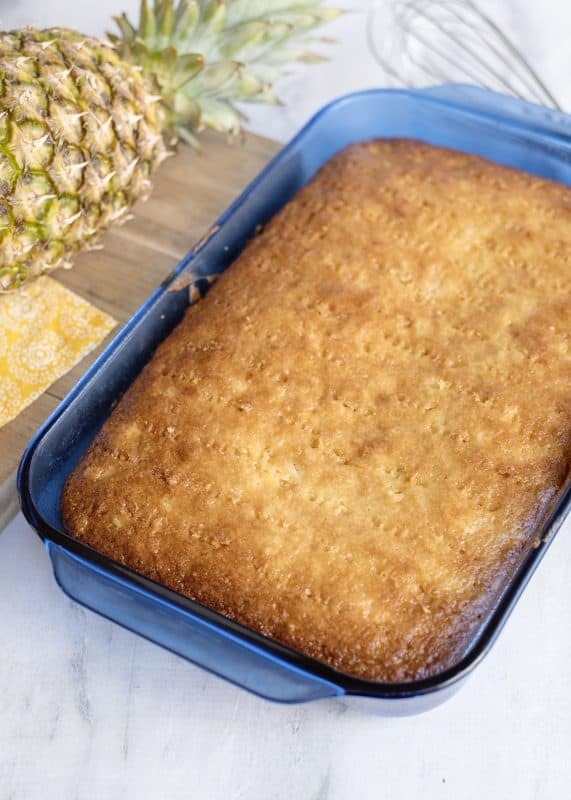 A delicious sheet cake soaked with a pineapple sauce with bits of pineapple in every bite! Top it with whipped cream as the perfect finishing touch. Scroll down for the recipe. If you’d like to visit a minute, keep reading. Where we are, spring has finally showed her pretty face. 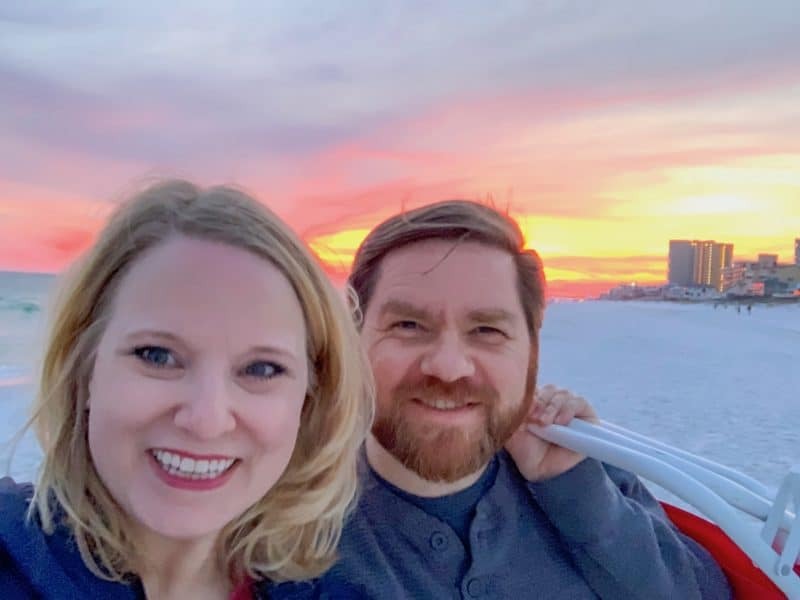 In fact, Ricky and I just got back from a quick weekend trip to the beach and the weather was just perfect. This is a trip we keep meaning to make an annual tradition of but so far we’ve only managed it twice int he last four years. Hey, 50% success rate isn’t too bad! After a winter of gray skies, it’s good for the soul to have a day or two of sunshine and blue water. In fact, most of what we did consisted of sitting on the beach watching the ocean. It’s amazing how perfectly content a body can spend watching the ocean and talking with your soulmate. We had great entertainment each of the two evenings we were there, and it was delivered to us on the beach, to boot! Check it out below. Well I promised you a cake recipe so in honor of us visiting the beach, let’s move on to the flavors of pineapple! The cake is made from scratch. 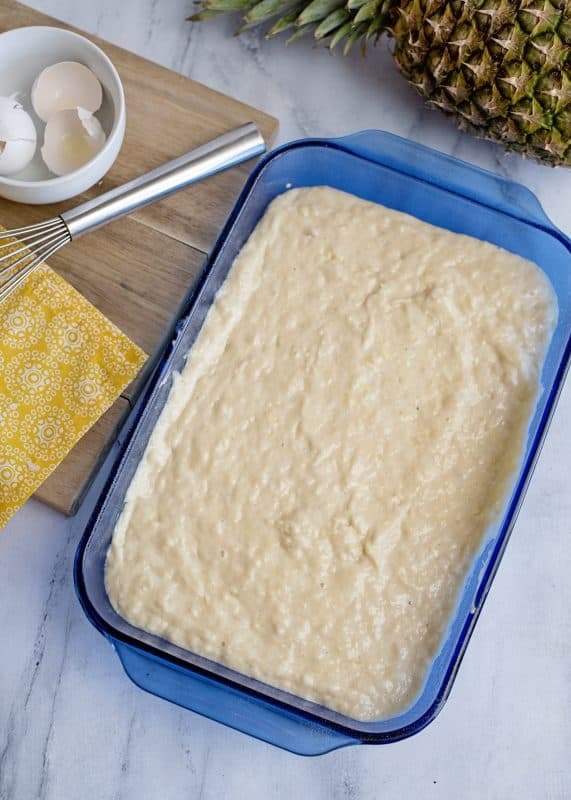 To make the cake, you’ll need: eggs, sugar, crushed pineapple (in juice), flour, baking soda, and salt. After it’s done cooking, we’re going to poke holes in it and pour a soaking sauce over. To make the soaking sauce, you’ll need: heavy cream, butter, vanilla, and more sugar. Of course, the printable recipe is in the card at the bottom of this post. I’ve recently upgraded my recipe cards and now folks who were having problems printing them are able to print again! 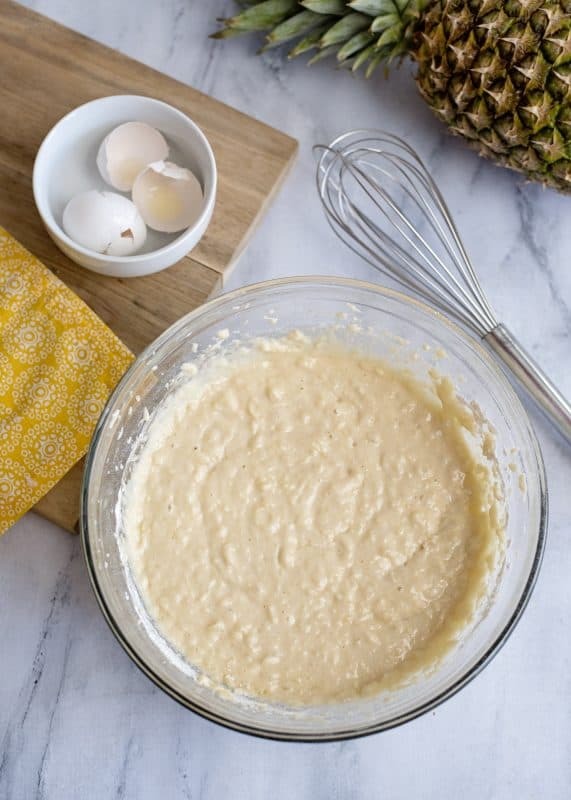 In a large bowl, place eggs, sugar, undrained crushed pineapple, flour, baking soda, and salt. Stir well by hand until well combined, about three minutes of stirring. You can also use an electric mixer if you like, for about two minutes. Pour batter into prepared pan and bake at 325 for 40-45 minutes or until browned on top and toothpick inserted in center comes out clean. 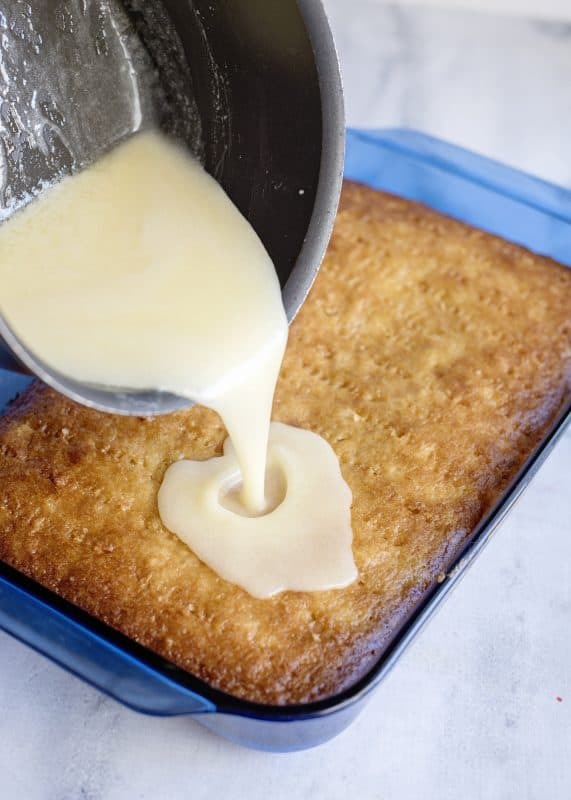 About ten minutes before cake is ready to come out of the oven, place heavy cream, sugar, butter, and vanilla in a small sauce pot over medium to medium high heat. Stir constantly and bring it just to a boil. Do not stop stirring and once it starts to boil remove from heat. Use a fork to poke holes all in the top of hot, cooked cake. Immediately pour hot sauce over hot cake and allow to completely soak in. Once cake has cooled slightly, serve with whipped cream. Cake can also be served at room temp or stored in the fridge and served cold if you like. 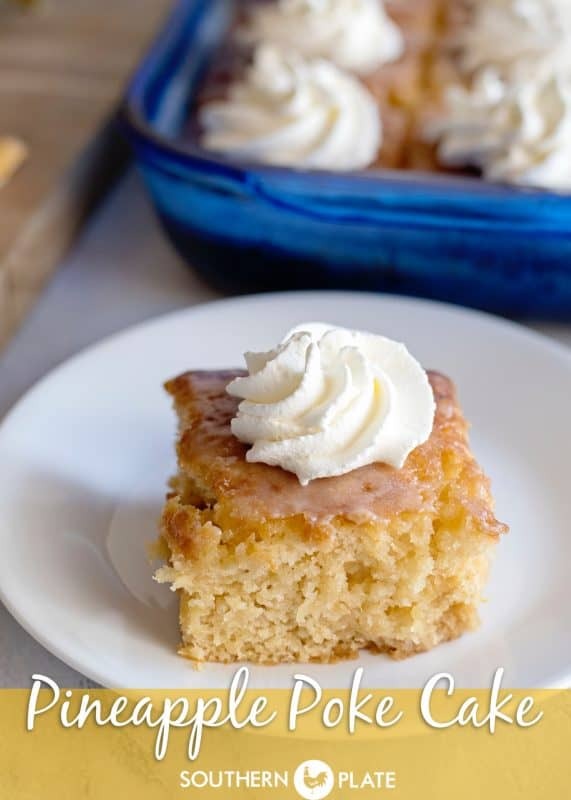 Enjoy this delicious Pineapple Poke Cake! 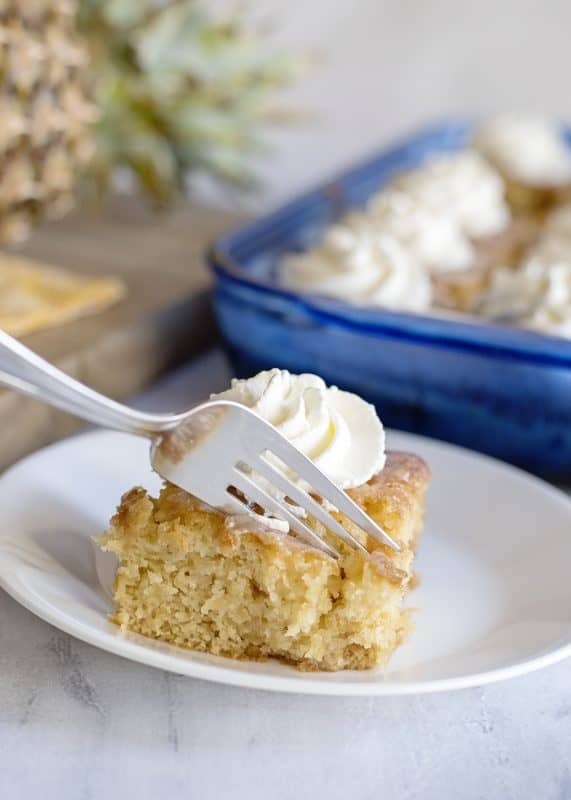 A deliciously moist from scratch cake with juicy bits of pineapple in every bite! Use a fork to poke holes all in the top of hot, cooked cake. Immediately pour hot sauce over hot cake and allow to completely soak in. Once cake has cooled slightly, serve with whipped cream. Cake can also be served at room temp or stored in the fridge and served cold if you like. Thank you for visiting with me today. While you’re here, make yourself at home and poke around the site a bit to see if there are any other recipes you’d like! You can see the entire index (nearly 2000 recipes) by clicking here. Be grateful for what you have and stop complaining. It bores everyone else, does you not good, and doesn’t solve any problems. Beautiful picture! The recipe sounds delicious! Perfect for Easter! Thank you. Thank YOU Pam! have a great day! Can this cake be made in a Bundt or tube (pound cake) pan? Ricky’s comment hits the nail on he head! AMEN! The Father is so good to us!!!! I love the new recipe cards. These old eyes can read them without having to use a magnifying glass. My eyes thank you. Oh Sharon I’m so glad!! Thank you for letting me know, I really appreciate the feedback! So happy that you had that great weekend. Good people deserve times like that. Cheryl, thank you so much, that is so sweet of you!!! We sure are grateful to have good people like you in our lives! What size dish do you use? Looks like a 13×9”?? Hey Sharon! it is a 9×13. Thank you for asking! I added that into the recipe card. I should have read recipe a little closer. Sorry I missed it. Thanks for letting me know. It was my error, not yours! you are so sweet, thank you, Sharon! No oil in this cake? Just checking as I want to make it soon, sounds & looks delicious! Thank you, Sue! no oil. The eggs and pineapple juice keep it moist, then you add that amazing soaking sauce and just fly to the moon! I am terribly sorry, Mickey. I had it in the blog post but not the card! It’s in there now. Thank you! Could you add coconut to the cake and could you use coconut cream instead of heavy cream? Merciful Maude, Darrellyn, you’re onto something!!!!!! That sounds amazing! Do you think evaporated milk could be used as a sub for heavy cream or would it be too thin? It would be a bit thinner but I think it would still work. I REALLY love the taste of evaporated milk! Husband loves le. Going try to make us this cake sunday. 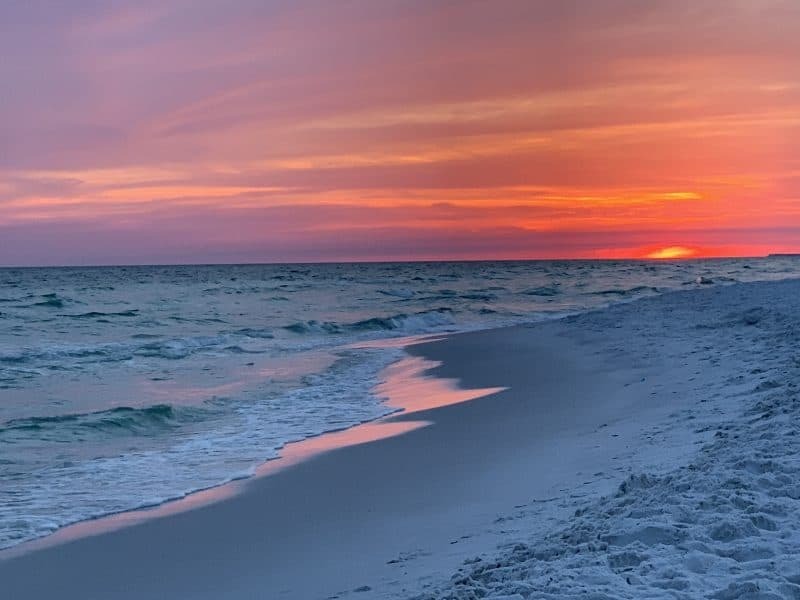 Love the beach pictures. Glad you were able to get away. Wow, that is a spectacular sunset!! Just gorgeous. I’m with Ricky on that! Thank you Aileen! The Father is such an amazing artist and each scene is such a gift! I was wondering if evaporated milk would work as a substitute for heavy cream or would it be too thin ? This looks really good, especially for people who like pineapple upside down cake but don’t like the cherries on it. GORGEOUS sunset!!! How CAN people see anything but an amazing Creator?! My family has made this cake off and on for years (the amazing thing being that I just looked at the recipe yesterday! ), BUT our cake has a kind-of-too-sweet cream cheese frosting, and yours… I think we have a serious improvement here! I have to try this! Thanks!! This sounds absolutely great, but I AM a huge brown sugar fan! Is there any place in this recipe where I could substitute brown sugar for white? Thank you so much, forever friend 🙂 I’ll get the goods at the store today! Hi, Christy! I just made this with my own tweaks, and it smells DIVINE! I added chopped ginger and a sprinkling of organic nutmeg to the batter. For the hot topping, instead of heavy cream, I used organic buttermilk, 1/2 cup of sugar, and about 2 tbs of coconut spiced rum. No vanilla (I make my own, by the way). I didn’t want the vanilla to take away from the delicate flavor of the coconut. After it soaked in, I layered with organic coconut flakes. Can’t wait for the fam to dig in tonight! I hope it turned out fabulous and everyone enjoys it!! Can’t wait to hear!! I can’t wait to try this cake. I have to convert all recipes to gluten free, but thankfully in this day and age that isn’t hard to do. Have a great weekend.